CALGARY, ALBERTA — Ryan Fairweather built a furnace in his backyard garage that heats up to 1,200 degrees Celsius — the same temperature as the corona of the sun. From it, he and his cohorts at Bee Kingdom make glassware that’s gained international attention (Elton John owns a piece, supporters of the company are quick to mention) and turned four guys from art school into magazine cover boys and trendsetters. There’s lots of, um, buzz around Bee Kingdom and not necessarily because of its product. Although the glassware, made in the rear of the group’s tiny bungalow, is outstanding, the true intrigue about this collective is the fact they can even exist, and flourish, in a city known for a sensational amount of wealth and a vacuum of creativity. “Being an artist in Calgary, we’ve really had to find our own way. We couldn’t graduate and find a prescribed path because there really wasn’t one. Everything we’re doing we’re kind of doing with trial and error. With that there’s been lots of obstacles, but lots of successes too. Because no one else is really doing what we’re doing, it’s been relatively easy to get some exposure,” Fairweather says, noting that Avenue, a glossy magazine that reports on the city, put Bee Kingdom on the cover and their trademark yellow Converse shoes have gained the attention of the likes of Naheed Nenshi, the popular, 40-year-old mayor who has become a symbol of Calgary’s newfound hipness. This city of 1.1 million has grown by more than 20 per cent in the past six years as more Canadians from the east, who a generation ago would have stopped in Toronto for work, skip over the nation’s largest city for the draw of big paydays and security in Calgary. 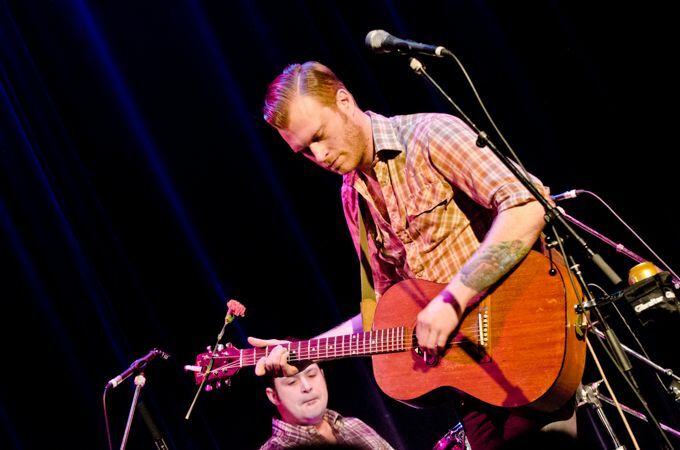 Until this year, though, there was little attention paid to Calgary’s efforts in using money made from the oil-and-gas industry — the source of plenty of Alberta’s wealth — to boosting the city’s image as an arts, music and dining hot spot. In 2012, Calgary is one of two Culture Capitals of Canada (Ontario’s Niagara Region is the other) and is receiving more than $3 million in funding from federal, provincial and municipal governments as well as the private sector. Calgary has long been considered bland, a western outpost thick with cowboy culture and thin on the cosmopolitan sophistication found in Toronto and Montreal. That’s changed, with an emphasis on public art (new buildings, by law, must have an art component accounted for in their design) and on the growing independent music and arts scenes. The evolution continues and Ewen’s gallery is the sort of place that’s vital for a city looking to encourage an arts movement. Its work is avant-garde, provocative, youthful and strange in that modern-art way. The Glenbow Museum, meanwhile, has established itself as a leading exhibitor of First Nations artwork and history. It worked in conjunction with the Blackfoot Nation and other aboriginal groups to create some of its galleries, a groundbreaking initiative that has helped to present a truer, or at least differing, history of the events surrounding the establishment of Canada. With artists like the guys from Bee Kingdom deciding to stick around, too, and with the city attracting more and more major performers for concerts and exhibitions, there’s the possibility of a prolonged expansion of the arts here. 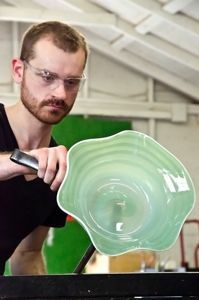 “One of the reasons we decided to stay in Calgary instead of moving to Berlin is because we had the opportunity to build a hot shop and because there really isn’t a scene here and we wanted to create a scene for glass in the city,” Fairweather says as he molds one of Bee Kingdom’s bowls that sell for $60-$80. With federal funding for arts programs shrinking disturbingly across the country, it’s an irony that the hometown of Prime Minister Stephen Harper is so keen on elevating its cultural stature. Festivals and public art exhibits are planned throughout the year and the 2012 Calgary Stampede, the event’s 100th anniversary, will be a focal point for the city’s creative types, along with its top rodeo performers. “You end up being a bit of a pioneer. The community is really close. If you are a painter or a photographer or a video-based artist or new media artist, we all hang out at the same pubs and there’s plenty of collaboration,” says Kai Scholefield of Bee Kingdom. The city is also becoming a notable dining spot, with restaurants like Rouge, CharCUT and Home Tasting Room offering sophisticated nights out. One of Canada’s top cocktail lists exists at Hotel Arts, where bartender Colin Tait, a Scottish immigrant, has earned international recognition for his drinks. Bee Kingdom: For a tour of Bee Kingdom’s studio and learn about the glass-blowing workshops it offers, contact beekingdom.ca. Glenbow Museum: Adult admission is $14 and the museum is open until 5 pm daily. For full details, visit its website. Art Gallery of Calgary: Admission is by donation and is open Tuesday to Saturday (10 am-5 pm; until 9 pm on the first Thursday of each month). Visit its website for details. 100th Calgary Stampede: Runs July 6-15. Find out more with Vacay.ca’s webpage devoted to the 2012 Stampede. Happy Fourth of July! Thanks, America!